Plano, TX – The quickly growing international campaign pressuring JPMorgan Chase to end its massive funding of extreme fossil fuels continued to escalate today as a delegation representing Indigenous and nonindigenous communities from Canada to Ecuador and across the U.S. gathered at Chase's annual shareholder meeting in Plano, Texas. 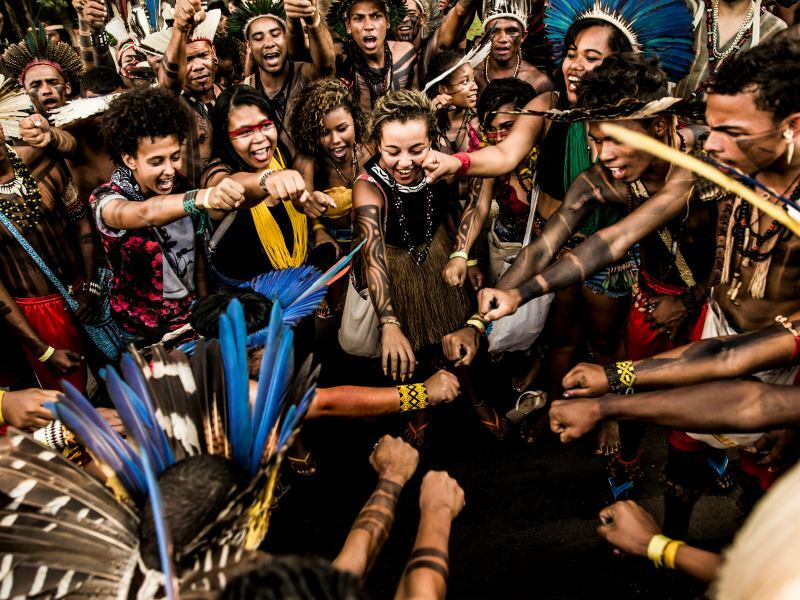 The delegation represents the broad range of people suffering harm from the environmental, indigenous rights and climate impacts connected to the bank's financing of the most dangerous and polluting forms of fossil fuels. Among major U.S. banks, JPMorgan Chase is the biggest funder of extreme fossil fuels: tar sands, Arctic oil; ultra-deepwater oil; liquefied natural gas export; and coal mining and power. It is also a major funder of oil drilling in the Amazon rainforest. An open letter penned by the delegation to shareholders, spotlights JPMorgan Chase in particular because of the unique scale and seriousness of the consequences stemming from its funding choices. "Jamie Dimon opens his most recent shareholder letter by boasting that JPMorgan Chase has 'helped communities large and small.' He omits mention of the other side of the balance sheet – the harm that his bank has done to communities like ours through its fossil fuel financing," reads the delegation in the open letter. Today's protest comes just one week after a nationwide day of action saw hundreds of people engage in demonstrations at Chase branches in cities across the country, including New York, Los Angeles, San Francisco, Portland, and Minneapolis. In downtown Seattle, fourteen arrests were made after demonstrators staged a dramatic action that shut down the streets outside while others occupied Chase's regional headquarters. 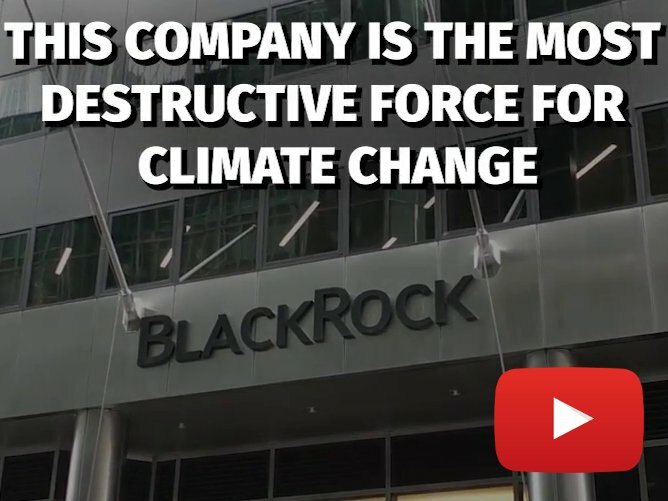 A briefing paper released recently by Rainforest Action Network (RAN) reveals that in spite of the urgent climate crisis and a public commitment to the Paris Agreement, JPMorgan Chase is doubling down on some of the most carbon-intensive, financially risky, and environmentally destructive fossil fuel sectors. According to the paper, which highlights data from Banking on Climate Change 2018, Chase is the biggest U.S. backslider, with extreme fossil fuel financing more than $4 billion higher in 2017 than 2016. For coal mining, the bank's financing in 2017 was a startling 21 times higher than the previous year – this despite the bank's policy to reduce its credit exposure to coal mining companies. 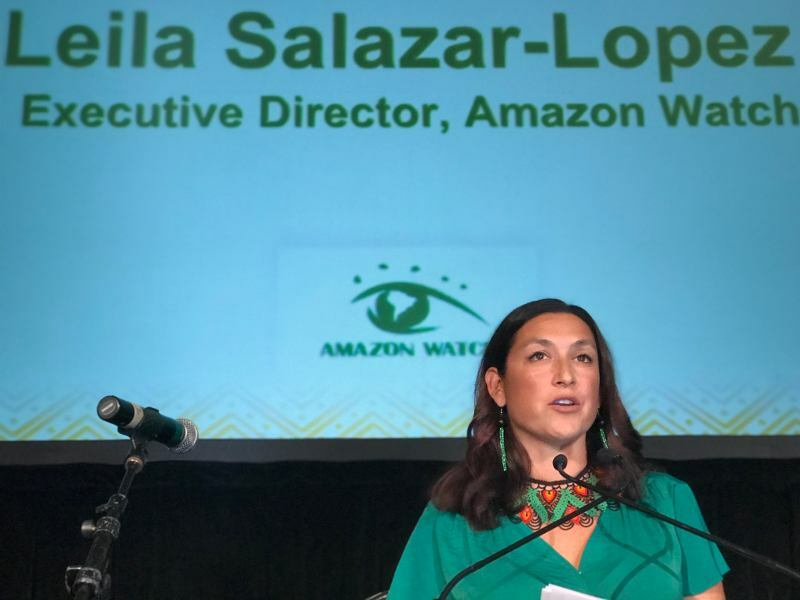 And in the Amazon, a report from Amazon Watch shows that the bank invests heavily in companies with licenses to explore and/or drill in the Amazon rainforest on or near the territories of Indigenous nations that oppose oil extraction on their lands. Delegates attending the AGM include Joye Braun of Indigenous Environmental Network, Tara Houska of Honor the Earth, Cherri Foytlin of Louisiana Rise, Cedar George-Parker of the Indigenous Youth Council, Bryan Parras of Sierra Club and Deyadira Arellano of the Texas Environmental Justice Advocacy Services (TEJAS), Jessica Lorena Rangel of Eyes of a Dreamer, Paul Corbit Brown of the Keeper of the Mountains Foundation, Yolonda Bluehorse and Frankie Orona of the Society of Native Nations, Manari Ushigua of the Sápara Nation in the Ecuadorian Amazon, Juan Mancias of the Carrizo/Comecrudo Tribe of Texas and Patrick McCully of Rainforest Action Network (RAN), Diana Best of Greenpeace USA and others. "Our prophecies foretold that the day would come when foreigners would try to invade our territory and we would have to resist or be wiped out. 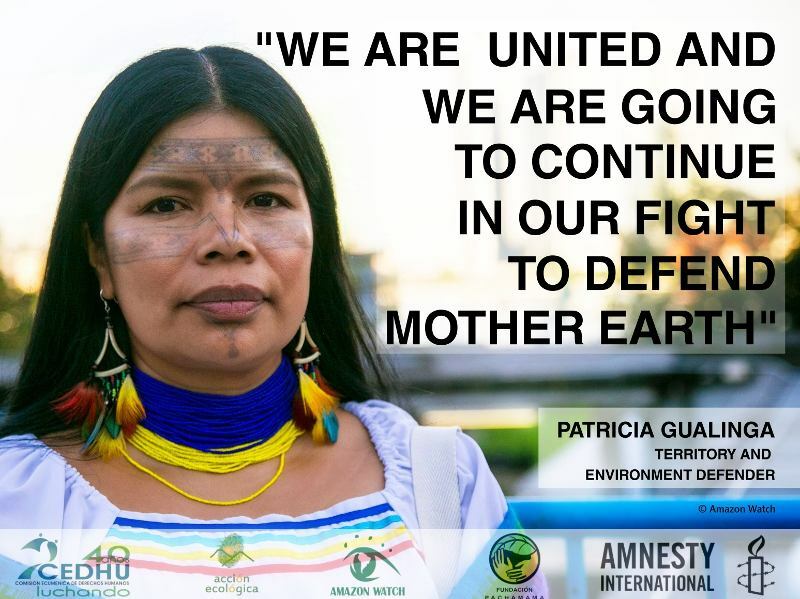 If Andes Petroleum, whose parent companies are financed by JPMorgan Chase, begins to drill for oil in our territory, it would lead to the destruction of our homes and our ancestral knowledge. We must keep the oil in the ground and help people learn how to heal Mother Earth. Our fight is not to slow the advancement of the rest of the world. Our fight is to defend life." Manari Ushigua Santi is a traditional healer and leader – an akameno (authority) – of the Sapara Nation in the Ecuadorian Amazon. He is from the community of Llanchamacocha, along the Conambo River in the region's remote roadless rainforest. He was instrumental in achieving recognition for the Sapara as a distinct ethnicity from the Ecuadorian government, and winning recognition from UNESCO for the Sapara as an "Intangible Cultural Heritage of Humanity". 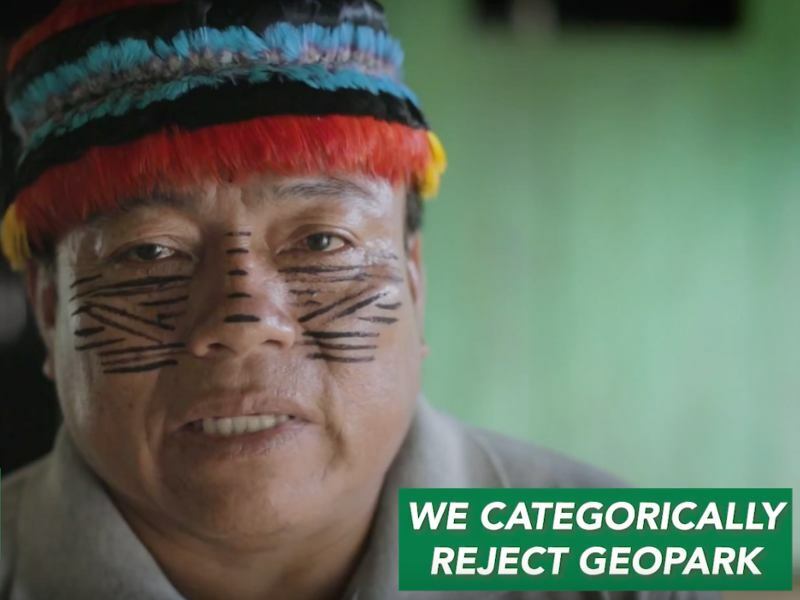 Manari has helped defend his territory from resource extraction for decades. 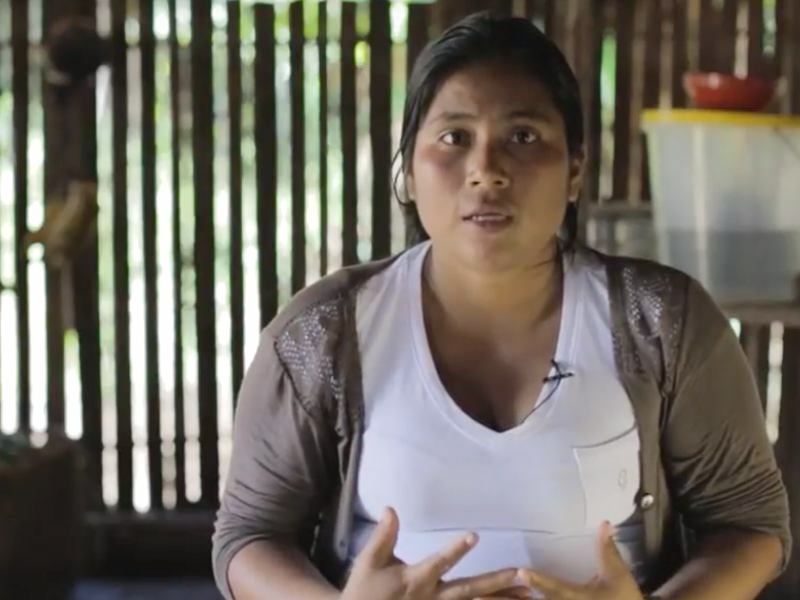 Manari also serves as an Environmental Ambassador for Ecuador's Education Ministry. "I'm fighting Chase bank because they fund Keystone XL pipeline and they're the biggest US bank that funds tar sands. And should the Keystone XL pipeline break along the Cheyenne River, it will reach the water intake of my people on my reservation within 33 minutes. We can't afford this. The time is now to stand up against climate change. The time is now to stand up against JPMorgan Chase." Joye Braun (Cheyenne River Sioux Tribe) with Indigenous Environmental Network (IEN). Joye lives in South Dakota and will be attending and organizing to speak on behalf of communities in the route of the KXL pipeline. Joye was an early representative at Standing Rock and part of the many prayers, actions and meetings that took place. "JPMorgan Chase has dramatically increased its backing of tar sands, the dirtiest, most carbon-intensive fuel on the planet. The heart of my people's culture would be obliterated if and when Enbridge's Line 3 tar sands pipeline breaks in Minnesota's vast watersheds and rich wild rice beds – Chase can play a major role in preventing this from happening by ending its credit relationships with Enbridge and all destructive fossil fuel actors." Tara Houska (Couchiching First Nation) is an attorney and National Campaigns Director with Honor the Earth, and will be representing the Anishinaabe people and the Great Lakes region from the impending threat of Enbridge's Line 3 tar sands pipeline. Tara was Senator Bernie Sanders Native American Adviser during his Presidential Campaign. Tara was also a strong voice and presence at Standing Rock and has carried on divestment work internationally over the past two years. "These Big Banks just can't seem to get it right - they say one thing but do another. When they keep pumping money into dirty fossil fuel companies and projects, it makes us all sick. Sick from the pollution, sick from the injustice, sick from an addiction that is killing us and our planet. We are done being a sacrifice zone, and we are done with your corporate lies. The people of Louisiana are gathering now to right your wrong. We will stop Energy Transfer Partners, and end your bad investments, such as the Bayou Bridge Pipeline. We are rising above your lies, your pollution, and your greed." Cherri Foytlin (Latinx, Black, Indigenous heritage) from Southern Louisiana. Cherri walked over 1,200 miles from Louisiana to Washington DC after the BP oil spill. Cherri has been a national movement leader to end offshore drilling and to stop the Bayou Bridge Pipeline. "The Trans Mountain Kinder Morgan pipeline will kill my land, salmon, and way of life. We will do whatever it takes to stop the pipeline-educationally, politically, and culturally." Cedar George-Parker is a member of T'sleil Waututh Youth and has followed a family tradition of leadership in his community. He has been active in the Vancouver area and with the Coastal Salish Indigenous First Nations to stop Kinder Morgan's Trans Mountain tar sands pipeline expansion. "JPMorgan Chase prides itself on being a great community partner, but we know that our neighborhoods are affected by their investments in unregulated industries that either pollute or lock-up our families, and sometimes do both!" Deyadira is a Texas Community Health Worker/Promotora for Texas Environmental Justice Advocacy Services. Her work as a community organizer includes the intersection of issues such as immigration, public education, environmental justice, healthcare, and workers' rights. Her Mexico/Tejas connection, grounded in family heritage and respect for nature, has given her the understanding to preserve and restore our land, resources, species, and humanity through collective decision-making, public pressure, and civic engagement. Following the effects of Hurricane Harvey in Houston and surrounding areas, Deyadira continues to support mutual-aid efforts and advocates for recovery justice. "As a top funder of extreme fossil fuel development, JPMorgan Chase is directly contributing to the pollution of our air and water and climate disasters like Hurricane Harvey. It's time for Chase to stop funding fossil fuels, pipelines, and other destructive industries, like private prisons and gun manufacturers, that threaten the health and safety of our communities." Bryan Parras is a Gulf Coast Organizer with the Sierra Club's Beyond Dirty Fuels campaign. He is also a co-founder of the Texas Environmental Justice Advocacy Services (t.e.j.a.s.) and has been organizing in the Houston area around environmental justice and public health issues for over twenty years. "Communities affected by bad decisions by the bank JPMorgan Chase are the same communities that are left behind when these projects go wrong. The Latino community, stands in solidarity with the other affected communities. Our people, including undocumented people, deserve a future with zero fossils in which we are treated well and we can live without fear." SPANISH: "Comunidades afectadas por las malas decisiones departe de el banco JPMorgan Chase son las mismas comunidades que son dejadas atrás cuando estos proyectos quedan mal. La comunidad Latina, se solidariza con las demás comunidades afectadas. Nuestra gente, incluyendo las personas indocumentadas, merecen un futuro con cero fósiles en el que seamos tratados bien y podamos vivir sin miedo." Jessica Lorena Rangel is the founder of Eyes of a Dreamer, an organization devoted to uprooting xenophobic stereotypes by telling the stories of immigrants through powerful images and words. She is also one of the five global moderators for the Immigration Subreddit. In her hometown of Pasadena, TX, she played a leading role in local organizing against SB4, a punitive law targeting sanctuary cities. In the wake of the devastating Hurricane Harvey, Jessica has been tirelessly working to get aid to undocumented families. Dismantling discrimination against all immigrants and empowering women of color, she is an emerging voice and leader for immigrant communities in Texas and beyond. "When the Carrizo/Comecrudo ancestral lands continue to be desecrated by fossil fuel corporations without due diligence, historical research, and Texas tribal consultation by either recognize or unrecognized Tribal Nations. The lack of respect to these descendants who speak and live their ancestral lifeways is an evil crime toward human beings and adds to the ongoing genocide of the Native Original People of Texas." Juan Mancias is tribal chair of the Carrizo/Comecrudo Nation of Texas, also known as the Esto'k Gna. Juan works to promote, maintain and preserve the Carrizo/Comecrudo culture, including by defending his people's sacred lands against fossil fuels and other threats. "Any investment is a gamble, and every company or individual has the right to gamble their own resources in the hopes of making a profit. However, no company, no individual has the right to gamble that which does not belong to them. Your money is far from the only asset that is at risk due to your investments in fossil fuels. Also on the table are the health of those living in the communities affected by the industries you support and profit from; the damage and devastation to the resources that WE ALL rely on such as clean water and clean air; and lastly, climate change. We are long past the time for taking climate change seriously. There is no debate among those who are thinking clearly and honestly." Paul Corbit Brown (European American) is a long time resident of Fayette County, West Virginia. Paul is an avid photographer & educator using his skills to challenge mountaintop removal and coal mining. Paul is active with the Keeper of the Mountains Foundation, an organization dedicated to protecting the Mountains, water and People of West Virginia. "Enough is "Enough, we must hold JPMorgan Chase accountable for being the largest funder of the destruction, contamination, and genocide of our Mother Earth and to our future generations. We must stand together now and demand change away from fossil fuels. By the time our children stand up for themselves, it might be too late, we need to stand together to wake up the world." Husband, Father, Entrepreneur and Activist, Co-Founder and Executive Director of Society of Native Nations (SNN). Frankie is Tongva and Chumash from California and Borrado from Texas. He is CEO of his IT company which delivers programming in the IT hardware and software sectors. He is a graduate of the University of La Verne and ITSP. He turned his lifelong passion of serving indigenous communities into the Society of Native Nations. A 501c3 that focuses on Native American rights, social justice, environmental justice and youth education. SNN works to help protect Native American spirituality, culture and traditional values. Frankie continues to work as an entrepreneur, allowing him the time needed to continue helping his community and people to preserve the spirituality and way of life of the indigenous communities of North and South America. His goal is to help create a better future for his children and all future generations. Frankie lives in San Antonio with his wife and children. "Financial institutions like JPMorgan Chase, do not realize that by supporting big oil corporations, they are also supporting the poisoning of Mother Earth and her most precious resources we human beings need to survive." Yolonda Bluehorse (Lakota) with Society of Native Nations have both been active in fighting Energy Transfer Partners (ETP) through opposition to the Trans Pecos Pipeline, divestment and at ETP Headquarters in Dallas. "Let me tell you, our dignity is not for sale…. If someone doesn't speak up, no one will." David worked as a union electrician; Director / Coordinator of Indian Center in Salt Lake City, Utah; Youth Alcohol and Drug Counselor at the Oklahoma City Indian Center and in Rapid City, South Dakota. He has been an advocate against alcohol and drug use as an activist his whole life and with the American Indian Movement since 1972. He has served with the Leonard Peltier Defense Committee as Director three times and National Advisor to the present time. He has organized national horse rides and demonstrations to bring awareness to the issue of unjust incarceration through violations of the U.S. Constitution against native people. David Hill continues to support events and demonstrations for indigenous rights, treaty rights, and human rights. "It is sadly not surprising that JPMorgan Chase is the biggest Wall Street founder of extreme fossil fuels given that its CEO, Jamie Dimon, shows zero understanding of the climate crisis, and that its longest serving board member, Lee Raymond, is the former CEO of ExxonMobil. Under Raymond, ExxonMobil spread disinformation about climate change, and poured millions of dollars into the worst climate denying organizations. Mr Dimon needs to get an education on climate change, and JPMorgan Chase's shareholders need to replace Mr Raymond with someone from a clean energy background." Patrick McCully is Climate and Energy Program Director for Rainforest Action Network. "Chase has a pipeline problem. While other banks around the world have recognized that funding extreme fossil fuel projects and the related companies is incompatible with any credible policy on human rights and climate change, Chase has doubled down. Chase continues to fund Energy Transfer Partners, the company behind the highly controversial Dakota Access oil pipeline, as well as other companies attempting to build devastating new tar sands pipelines. Chase is dragging its feet as the world is rapidly moving away from fossil fuels, threatening not only Indigenous rights, water, and the climate, but also its own reputation in the process." Diana Best is a Senior Energy Campaigner for Greenpeace USA and Global Pipeline Finance Lead.